These test procedures are based on OIML R87 (2017 version). Determine the inspection lot to be sampled using random sampling in accordance with Clause 4.4 of OIML R 87. ​​Determine a sample size appropriate for the inspection lot from Column 2 of Table 2 within OIML R 87. ​Determine a sample size appropriate for the inspection lot from Annex H within OIML R 87. ​Determine the tolerable deficiency (T) appropriate for the nominal quantity of the prepackages, according to Clause 3.4 and Table 1 within OIML R 87. ​Determine the number of prepackages allowed to exceed the tolerable deficiency from Column 3 of Table 2 of OIML R 87. ​Determine the Average Tare Mass (ATM) by using the procedures in Annex B of OIML R 87. ​Determine the actual quantity of the product and subtract from it the nominal quantity (Qn) of product to calculate the individual prepackage error, as per Clause 2.1.2.2 of OIML R 87. Compare each negative individual prepackage error obtained to the values for T.
2) Reject the lot if the number of prepackages having a T2 error is larger than zero, as per 4.3.3 of OIML R 87, the sample fails. ​Determine the number of pre-packages allowed to exceed the tolerable deficiency from column 3 of Table 2 of OIML R87. ​Determine the average tare weight by using the procedures in Annex B of OIML R 87. ​Determine the actual quantity of the product and subtract from it the nominal quantity (Qn) of product to calculate the individual pre-package error. These test procedures are based on OIML R87 (2004 version). ​​Determine the inspection lot to be sampled using random sampling in accordance with clause 4.2 within OIML R 87. ​​Determine a sample size appropriate for the inspection lot from column 1 of Table 1 within OIML R 87. ​Determine the tolerable deficiency (T) appropriate for the nominal quantity of the pre-packages according to 4.2.3 within OIML R 87. 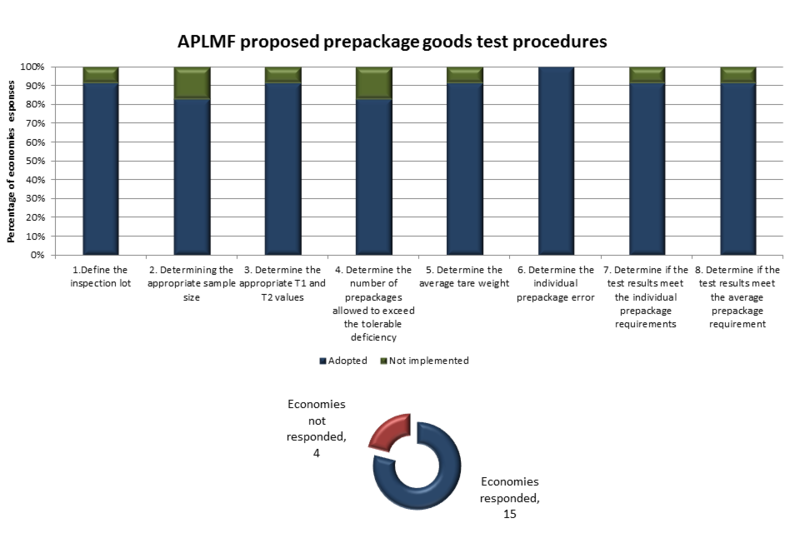 ​Determine the number of pre-packages allowed to exceed the tolerable deficiency from column 4 of Table 1 of OIML R87. ​ Determine the average tare weight by using the procedures in Annex B of OIML R 87. Determine the actual quantity of the product and subtract from it the nominal quantity (Qn) of product to calculate the individual pre-package error. ​Compare each negative individual pre-package error obtained to the values for T.
​MEDEA Project: Training Course on Pre-packaged Goods. Held in Nanning, PR China from 10-13 April 2018. Summary of economy reports can be downloaded here. 2018 Survey results can be downloaded here.